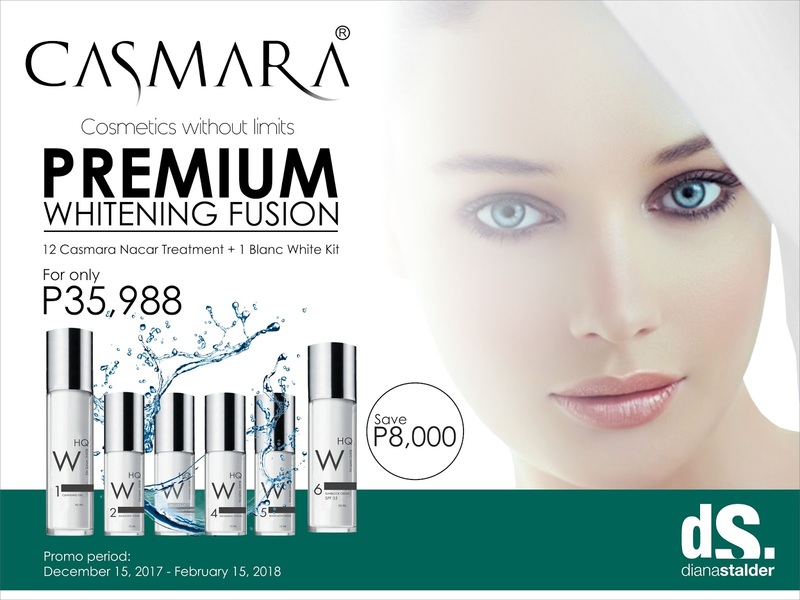 Diana Stalder Face, Body, Skincare Center brings the premium whitening fusion, a combination of two powerful brands for fast and effective whitening. Casmara Nacar Treatment is an imported brand from Spain. It is a skin lightening and illuminating treatment which is suitable for all skin types, especially for skin with localized and/or diffuse blemishes. Blanc White is a full range of whitening and anti-aging system. It is a six-step, high-quality beauty regimen packed with a powerful combination of premium products that work together to deliver an anti-aging and whitening benefit for a youthful-looking and radiant skin. Actively supports the generation of new cells, helps stimulates collagen synthesis, enhances skin elasticity and firmness and promotes healthier and fairer-looking skin. Clients could avail the Premium Whitening Fusion at the discounted price for only Php35,988 with a savings of Php8,000 which they could consume within a year. Promo period is on December 15, 2017, to February 15, 2018.